The cheapest, most popular and surely not least comfortable means of transport for traveling around in Thailand (though arguably also the least safe) is probably by bus. Thailand has a ramified network of bus routes crisscrossing the entire country and a bus terminal can be found in virtually every small town. There are frequent connections between Bangkok’s three main bus terminals and almost every city and province. Morchit bus terminal, not far from Bangkok’s old Don Mueang Airport, is a gigantic complex on the northern edge of the capital. It caters for the northern and north-eastern routes and connects Bangkok with the provinces in the North (like Chiang Mai and Chiang Rai) and the north-eastern region of Isaan. Ekamai bus terminal on Sukhumvit Road in Bangkok’s South has immediate access to the city’s “skytrain” (BTS) and links the capital with destinations along the East coast (e.g. Chonburi, Pattaya, Rayong, Trat and Koh Chang). The Southern bus terminal (Sai Tai Mai) on the Western outskirts of Bangkok has connections to destinations in the South and West of the kingdom (e.g. Phuket, Krabi, Surat Thani/Samui, Kanchanaburi). It’s highly recommended to avoid overland buses without air-conditioning but stick to the slightly more expensive air-con VIP coaches, especially when traveling overnight and long distances. The only drawback is that the air-con on Thai buses can get very cold very quickly, so you’re advised to wear long trousers and a sweater or jacket. Long-distance coaches tend to be extremely busy on public holidays like Songkran and New Year; where possible, advance booking is recommended, or simply avoid traveling on these days. Thailand’s state-owned Transport Co. Ltd., which runs many of the buses in the kingdom, also has a website, however, it’s mostly in Thai language and not really helpful. There are frequent connections between the small bus terminal on North Pattaya Road, near the junction with Sukhumvit Road, and Bangkok’s main bus terminals. Buses to Bangkok depart virtually every 30 minutes from here, starting from around 5 a.m. in the morning until late evening. The price for a one-way ride to Bangkok approximates 120 Baht. Suvarnabhumi Airport can also be reached from the North Pattaya bus terminal. Minivans to Bangkok (Victory Monument) depart from several locations around Pattaya, most from near the traffic lights at the intersection of South Pattaya Road and Second Road in South Pattaya. Fares start at approx. 100 Baht, with minivans departing as frequently as every 15 minutes. PattayaVan, part of the same company that runs the bus services to Bangkok from the North Pattaya Road bus terminal, is one of the more reputable companies providing minibus services. Minivans from Jomtien to Bangkok depart every full hour from outside the Family Mart at the corner of Jomtien Beach Road and Soi 5 (fare 150 Baht). If you plan to stay in Bangkok for a night or two before moving on to other destinations, there’s an extensive selection of guest rooms to choose from all over town. So while advance booking isn’t really required (unless it’s high season) you might well save a few Baht with online booking sites and also get to pick a place in a central location, where you don’t rely on Tuktuks or taxis to continue your journey. Aside from Bangkok, many other regions and destinations can be reached directly from Pattaya. 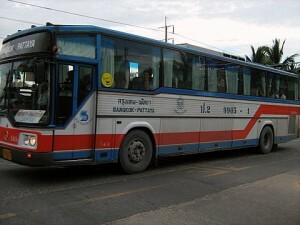 For example, the “407 Pattana” bus company, located at the Petronas gas station just around the corner from Pattaya Klang on Sukhumvit Road, connects Pattaya with the northeastern provinces of Isaan (Khorat, Khon Kaen, Udon Thani, Nongkhai). Vientiane and Laos can also be reached conveniently via Nongkhai. Nakornchai Air on the opposite side of Sukhumvit Road (turn right when coming from Pattaya Klang) is one of the most reputable bus companies in Thailand and operates bus services to Chiang Mai in the North and Ubon Ratchathani in Isaan. 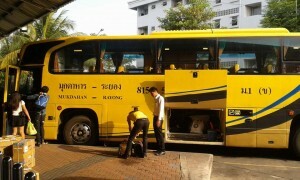 The so-called Yellow Bus (Roong Reuang Coach Co. Ltd.) operates routes from Pattaya to Mukdahan at the Lao border (via Buriram, Surin, Roi-Et, Yasothon etc. ), Hua Hin and Koh Samui, as well as connections from Hua Hin to Phuket. A VIP bus straight from Pattaya to Phuket leaves every night at 6 p.m. from the “777 bus” station on Pattaya 3rd Road (North Pattaya Road end). With only one departure per day, advance booking is highly recommended. When traveling from Pattaya to provinces of minor touristic importance, it’s recommended to travel via Bangkok. Unless you know you’ll be staying at a friend’s place, it’s also a good idea to book a room online before traveling to the Thai countryside. 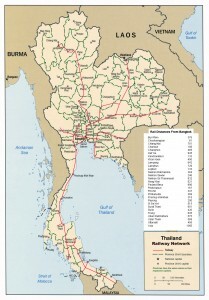 Thailand’s railway network, although much less developed than the country’s ramified bus network, still covers all regions of the country. Trains in Thailand may be relatively slow in comparison with overland VIP buses or trains in the Western world; when traveling long distances, however, a night trip in a first or second class carriage with sleeper berths (lower bed recommended) can be a comfortable and cheap alternative. Several high-speed rail lines are also being planned. For more details, timetables and fares for all routes, please visit the official State Railway Of Thailand (SRT) website (the English-language pages are unfortunately not very functional) or call the SRT Hotline 1690. Good info on train travel in Thailand can also be found at Seat61.com. Pattaya’s little railway station is situated off Soi Siam Country Club, on the so-called “Dark Side” east of Sukhumvit Road. The telephone number is 038-429 285 (only Thai language). There’s one daily train connection between Pattaya and Bangkok, departing from Pattaya at 14.21h and arriving at Bangkok’s Hua Lamphong station at 18.25h. The one-way fare is 31 Baht (only 3rd class available). Due to the length of the journey, however, this alternative should be of interest exclusively for die-hard railway fanatics. The only service that makes Pattaya’s railway station interesting is that you can buy railway tickets for trips all over Thailand here, including for journeys departing from Bangkok. Tickets can be booked here up to 60 days in advance (the counter is open until 4.30 p.m. every day). Advance booking is highly recommended – especially when you’re traveling over public holiday periods like Songkran and New Year, or if you want to secure a sleeper berth in an air-conditioned train. Online booking is unfortunately not available at the moment. A rented car might be useful for tourists who don’t feel comfortable riding a motorcycle but prefer to be independent and wish to explore Thailand on their own. Along with dozens of local firms, all major international car rental companies are operating in Thailand. For a listing of car rental companies based in Pattaya, please see our Get Around in Pattaya page. The basic requirement for driving a car in Thailand is either an international or preferably a Thai driving licence; although most local car rental companies should be satisfied with a national driving licence only. Please note, however: If you manage to rent a car without the appropriate driving licence, not having one would invalidate your insurance and count against you in the event of an accident. Also, if police should catch you without an appropriate licence, you’d be punished by a fine. Unlike in other Southeast Asian countries, roads in Thailand are in excellent order but, as driving can be hazardous sometimes, particularly if you’re not used to driving on the left, it might be a good idea for less experienced motorists to hire a car with a driver. Due to ever-increasing competition in commercial aviation and the launch of several low cost airlines that operate flights throughout Thailand, domestic flights have become increasingly popular with tourists and Thais alike. With most budget airlines you can simply show up at Suvarnabhumi or any other Thai airport and buy a ticket right at the counter – often for less than 2,000 Baht. Some air tickets can also be purchased online, from local travel agencies, or even at 7-Eleven stores. 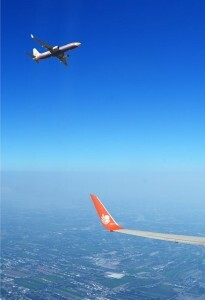 Most airlines also operate flights to other nearby countries in the Southeast Asian region and beyond. Please just keep in mind that advertising fares – due to additional taxes and surcharges – are usually only a fraction of the total price you have to pay for your flight. For further details, destinations, fares and online booking, please check the airlines websites listed below. Suvarnabhumi Airport (official website) – Flight information, passenger guide etc. Airports of Thailand (official website) – Real time flight schedule, passenger guides, maps etc. AirAsia (Thai) – Popular Malaysian budget airlines operating frequent flights throughout Thailand and South-East Asia; has very cheap offers when booked well in advance. Bangkok Airways – Bangkok Airways operates scheduled services to 20 destinations in Thailand, Cambodia, China, Japan, Laos, Maldives, Burma, Singapore and Vietnam; had a monopoly on flights to Koh Samui in the past. Jetstar Asia Airways – Australian low-cost carrier operating flights from Bangkok and Phuket to Australia and a number of Asian destinations. Nok Air – Budget airline with a similar price scheme as AirAsia; operates flights to several domestic destinations. Bookings can be made online, directly at the airport or by phone. Payments can also be made at 7-eleven stores. Thai Airways – Thailand’s national airliner, a member of the international Star Alliance, offers frequent flight throughout Thailand, but is also the most expensive local carrier. Thai Smile – Thai Smile Air is a new lower-cost airline, operated by Thai Airways, that began operations in July 2012 and flies to several destinations across Thailand as well as a handful of other Asian countries. Tiger Airways – Budget airline that operates flights throughout Southeast Asia and to Australia, as well as a number of domestic destinations within Thailand.